Following on from the basic step, another very useful step in the social foxtrot is the Promenade. Generally, “promenade” when used in any of the dances means that both the leader and the follower are moving in the same direction; which in hold, requires the leader's left shoulder and the follower’s right shoulder to be opened slightly to face the line of dance. Other than that, regular hold is still maintained. 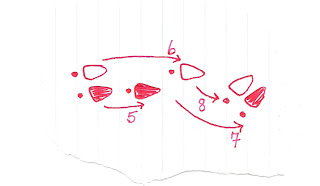 In Social Foxtrot, the Promenade always begins after half of a Basic step (the leader has just gone forward and the follower backwards). And finishes with the second half of a basic where the leader steps backwards and follower forwards. Begin facing diagonally with your left shoulder to the inside of the circle you will be dancing. Start with your left foot, taking a step forward into the first half of your basic step. Take your second “Slow” step on your right as in the basic. Instead of turning your shoulders to complete the basic step which would then allow you to move backwards, take a side step (Left) and close together (Right) with no turn. Slightly turn your shoulders to the left – opening away from your partner – and gently indicate to your partner to open up as well by pulling your Right hand slightly towards you and putting the pressure of the connection through the heel of your hand not the whole palm. 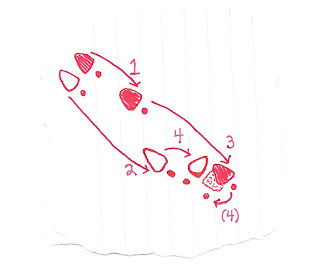 Starting on your left foot, take two walks straight down the line of dance (Left, Right) as your next two Slow counts, and the complete the move with a side, together (Left , Right) over which you will turn slightly to your left so that you are positioned facing diagonally against the line of dance (ready to do the backwards part of your basic). 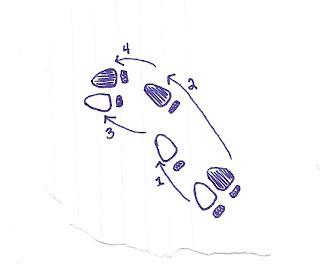 Walk forward for your two Slows (Right, Left) and then do your Side step (Right), Together (Left) with barely any turn – allowing your partner to step in front of you again and back to regular hold. The next step will be the forward part of your basic movement, stepping forward onto your Right foot. - This step only happens when the follower is moving backwards. 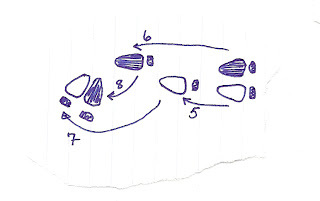 - The couple moves in the same direction, facing the same way for the two Slow steps in the middle of the sequence. At all other times their feet are in line with each other. - The leader should indicate to the follower that he is entering the step by guiding her left side slightly towards him and then exerting slight force in the direction you both will be travelling – this should open her shoulders to be face the line of dance.